We don’t blame you for wanting better sound than your TV provides out of the box. We also don’t blame you for feeling overwhelmed at the sheer variety of choices, which is why we’re going to explain all the options to you. The options range from simple (soundbars) to complicated and expensive. What will work best for you depends on your budget and how good you want the sound to be. Soundbars are the simplest, quickest way to enhance your TV sound experience. Installation is typically limited to plugging in a few cords and powering up the soundbar. You can spend a little or a lot on a soundbar, depending on the quality of sound you’re looking for, but they’ll always be compact and fit into a nice space right under your TV or mounted on the wall. A soundbar is always an upgrade on standard TV sound and some of the higher end models produce remarkably beautiful sound. If you want bass, a soundbar will typically require an added subwoofer. You can purchase a soundbase, which is very similar but is also big enough to include bass, if you want to avoid buying separate products. With sound, size matters, which is why floorstanding speakers are generally regarded as the best option for big sound. They’re quite large and can take up a great deal of space, which is why some people stay away from them. They come in a variety of styles and prices, but they’re all freestanding units that connect to your TV and can provide a breathtaking sonic experience. 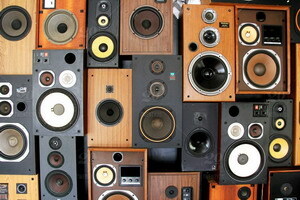 You also get the freedom to move them around the room as you like to provide the best sound. As the name suggests, bookshelf speakers are small enough to fit on a bookshelf. They’re similar to floorstanding speakers, only smaller. Because of their size they tend to be less eye-catching in a room (which can be a good thing) and easier to place in a cramped space. They offer good performance and are often paired with a subwoofer to offer nice big bass. These typically require professional installation, but if you want great sound without the potential ugliness of speakers sitting on the floor or resting on your bookshelves. They are, as the name suggests, speakers installed in your walls or ceiling. They make it easy to enjoy surround sound without ungainly speakers all over the living room. These days you can buy compact home theater systems that offer incredible sound for a reasonable price. They tend not to require professional installation, either, though if you want it to look great you can always hire someone. Typically these systems come with four speakers (two for surround sound), a subwoofer, and a separate amplifier to improve the quality of the sound. It’s a full-featured solution that requires a little more effort, but if you want the best TV and movie watching experience, this is a great option to consider. As you can no doubt see, you have a massive number of options for improving your television sound experience. If you want to keep it cheap and simple, go with a soundbar and add a subwoofer if you really like bass. If you want a cutting edge, truly breathtaking sound experience, consider one of the other options on the list. A home theater system (sometimes called home theater in a box) is a pretty great way to make watching movies at home feel a lot like going to the theater. As long as you properly assess your needs beforehand, you can’t go wrong buying any of the options listed.